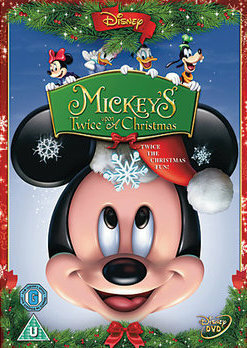 Mickey's Twice Upon a Christmas is a 2004 direct-to-video film and the sequel to Mickey's Once Upon a Christmas. It's one of the first productions to show Mickey Mouse with 3D animation. It contains five short Christmas stories featuring characters like Mickey Mouse, Donald Duck and Goofy. "Belles on Ice": Minnie Mouse and Daisy Duck are competing in an ice skating competition. Daisy becomes jealous of the crowd's reaction to Minnie and tries to take over the spotlight. The battle for the spotlight escalates when Daisy summons Fantasia hippos, Minnie responds with Fantasia crocodiles, and both girls perform daredevil stunts. "Christmas: Impossible": Huey, Dewey, and Louie are celebrating Christmas Eve. They're convinced that they're on Santa's naughty list, so they travel to the North Pole to write their names on the nice list themselves. However, at Santa's workshop, they accidentally make a huge mess and ruin the gifts. The boys feel guilty and have to fix the mess to save Christmas. "Christmas Maximus": Most of this story takes place within the song "Make Me Look Good". An adult Max brings his friend Mona home for Christmas. Unfortunately, Max finds Goofy's behaviour amazingly embarrassing. "Donald's Gift": Donald wants a Christmas of peace and quiet. The others want Donald to enjoy Christmas, but Donald just becomes annoyed. "Mickey's Dog-Gone Christmas": Pluto accidentally ruins Mickey's Christmas decorations and is sent to the dog house. He leaves Mickey in shame and ends up being adopted by Santa's reindeer. As Christmas approaches, Pluto becomes homesick and Mickey searches for his lost pet. Aesop Amnesia: Once again, we have Max learning to appreciate his dad and that he is lucky to have him even if he is embarrassing. You know, the EXACT SAME LESSON that he learned in A Goofy Movie AND An Extremely Goofy Movie? Amazingly Embarrassing Parents: When Max brings home his friend Mona to meet Goofy, Goofy shows Mona baby pictures of Max. Award-Bait Song: Share This Day by Josh Kelley. Arc Words: "Less is more" in Mickey's Dog-Gone Christmas. "Christmas: Impossible" has Santa and an elf reference a horrible sleigh crash that occurred in 1964. It's discussed later on in "Mickey's Dog-Gone Christmas" by Blitzen and Donner. A cranky-looking man in a plaid shirt keeps turning up somewhere in all the stories except the first. He most noticeably appears in "Donald's Gift", getting his hot chocolate spilled on him, twice. Defcon Five: Averted. Santa's Workshop gets it right. The code for catastrophe is "Elf-Con 1". Do Not Do This Cool Thing: In-universe. Scrooge tries to tell Huey, Dewey and Louie to be nice. When they point out that Scrooge became rich despite not being nice, he says it was because he was selfish, HD&L's reaction? "We want to be rich and selfish, too! ", followed by talking about some cool stuff they could buy with the money they wanted. Drives Like Crazy: "Mickey's Dog-Gone Christmas" sees a snowplow driving up onto Mickey's lawn. Goofy was driving. It's heavily implied that he was also driving the snowplow that buried Mickey's car earlier in the story. Embarrassing Nickname: Max hates it when Goofy calls him "Maxie". Embarrassing Old Photo: In "Christmas Maximus", Max brings his girlfriend home from college to meet his dad. At one point while Max is proudly showing her old pictures of himself as a child graduating high school, Goofy brings in an enlarged photo of Max as a baby. Everything's Louder with Bagpipes: At the end of "Christmas: Impossible", Scrooge gets a set of bagpipes for Christmas. He's unskilled and plays loudly. Santa saw this coming and sent Huey, Dewey and Louie earplugs. Flushing Toilet, Screaming Shower: In "Christmas: Impossible", Huey, Dewey and Louie flush the toilet while Donald is in the shower. Donald screams because the temperature of the water abruptly changes. Friend to All Living Things: The other characters drop whatever they were doing in "Mickey's Dog-Gone Christmas" to help look for Pluto. Scrooge even bought an entire snowplow company. Gilligan Cut: Daisy tells Donald to stop being selfish and to come with her and his nephews to the mall. Donald: I'm not going! And that's final! Green-Eyed Monster: Daisy and later Minnie in "Belles on Ice" when fighting over the spotlight. Heroic BSoD: Mickey while searching for Pluto. Pluto is initially thrilled to be with the reindeer, but after seeing a cloud resembling Mickey, he becomes depressed. Jerkass: Donald due to having no Christmas spirit at first in "Donald's Gift". Jerk with a Heart of Gold: Donald redeems himself at the end singing the Christmas carols with everyone in "Donald's Gift". Meaningful Echo: From "Mickey's Dog-Gone Christmas": "Who's my pal? Who's my pal?" It's what Mickey says to Pluto early on and Donner later saying it briefly shakes Pluto from his depression. Mondegreen: The guy doing the subtitles for both the DVD and Blu-Ray apparently has trouble understanding Donald's voice. During the end of "Donald's Gift", Donald says "Everybody, from the heart!" while the subtitles claim he's saying "Everybody, clap your hands! ", despite the fact that no one is clapping in that scene. Minnie and Daisy's antics in "Belles on Ice" reach this point. Huey, Dewey, and Louie in "Christmas: Impossible" after realizing that their antics in Santa's workshop have made it impossible for Santa to make the big trip thus ruining Christmas for the world. "Oh, Pluto, if only I hadn't yelled at you." Noodle Incident: The Sleigh Crash of '64. First brought up in Christmas: Impossible by a minor character, it's referenced again by Donner and Blitzen in Mickey's Dog-Gone Christmas. Donner: I've never seen so many toys scattered! Blitzen: That barn came out of nowhere! Paper-Thin Disguise: Huey, Dewey, and Louie mosey around Santa's workshop wearing their usual monochrome shirts plus green hats. Their doubts of success disappear the moment an elf addresses one as "fellow elf." The end of the short, though, reveals that Santa wasn't fooled. Mickey's Twice Upon a Christmas is the sequel to Mickey's Once Upon a Christmas. "Mickey's Dog-Gone Christmas". "Doggone" is an an exclamation of annoyance, disappointment, etc, and the episode is about Mickey's dog being gone. Punny Name: Donner names Pluto "Murray" as a spin on "Merry Christmas." Sarcasm-Blind: Donner constantly, much to Blitzen's annoyance. Saving Christmas: When, Huey, Dewey and Louie accidentally ruin the gifts at Santa's workshop, they try to fix the problems they've caused. At Santa's workshop the PA system being a statue with a mouth that drops opens when "speaking" and then snaps closed when done, both with a clunk sound, might be a nod to the old design of Cybermen. When Pluto, Santa, and the reindeer land on the roof, they hide themselves by pretending to be a rooftop decoration. Decorations that look just like them have been real for a long time. Sustained Misunderstanding: When Santa tells his reindeer that the dog "Murray" that they adopted is really Pluto. Blitzen: I think he's Murray. Verbal Tic: Jailbreak Bob has one, see? Was Too Hard on Him: Mickey sends Pluto to his doghouse after his attempt to put the star on the Christmas tree ended up with all of Mickey's decorations destroyed. Later, when Mickey fixes everything, he begins to feel bad for how he yelled at him and goes to the doghouse to apologize, only to find that Pluto had run away. You Need a Breath Mint: Subverted. Santa yawns in Louie's face, causing him to recoil. He suddenly says that his breath smells like peppermint and mocha.